So you've purchased a smart speaker like the Google Home ​​or the Amazon Echo, you are getting used to some of the voice features, maybe you've connected some smart lights ​​and started to spoil yourself by turning the lights off with your voice after you are already in bed. It's true that you can do a lot with a smart speaker, but there are some things like motion sensors, water sensors, and door and window sensors that can extend your smart home functionality as well as add a bit of security. Thankfully the Samsung SmartThings Hub is here with the solution. In August 2014, Samsung purchased SmartThings for $200 million and then went to work on creating a lineup of connected products that work well together and are also compatible with Google Assistant and Amazon Alexa. A Samsung SmartThings Hub will allow you to Combine Samsung's wide variety of sensors and connected devices with all of the voice functionality of a Google Home or an Amazon Echo. With the SmartThings Hub's compatibility with IFTTT, you have an incredible range of functions that you can set up to customize your home in nearly any way you want. 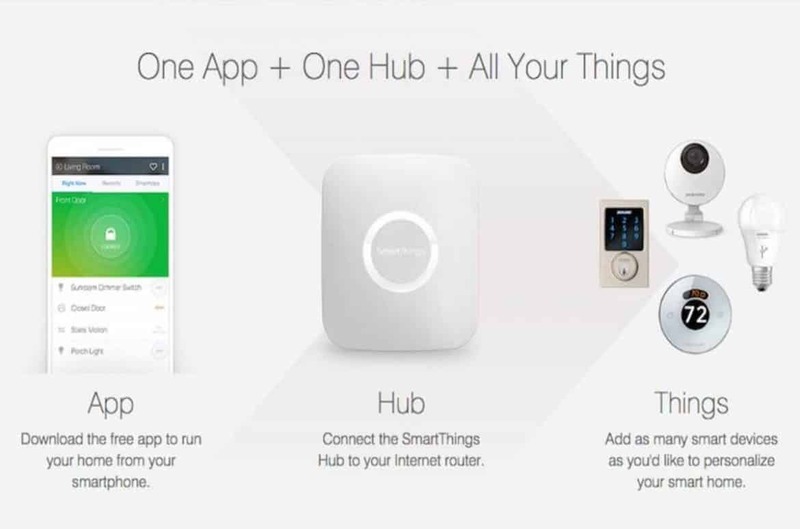 So what can the SmartThings Hub do and why should it be the next addition to your home? Being able to control appliances like your TV and your lights just with your voice makes a lot of daily tasks a joy, but what if you want to delve a little bit deeper and begin to truly automate your home? 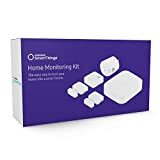 Samsung SmartThings is compatible with over 200 sensors, meaning that you can keep tabs on when your family comes and goes, the temperature inside and outside of your home, know when your doors and windows are opened and closed and more. Sensors not only allow you to automate more, but they also add an element of security, from being notified if your door is opened to alerting sirens and turning on lights. Door and window sensors work by placing a sensor on a door or window and another sensor on the wall or door frame so that they are touching. The sensors will perform functions like alert you if they disconnect and can be programmed to work with other sensors and devices connected to your SmartThings Hub. SmartThings is compatible with a wide variety of door and window sensors from Samsung's own Multi-Purpose Sensor to the Ecolink Door/Window Sensor. They also come in various shapes and styles in order to suit whatever space or decor you are working with. Smart outlets allow you to control your outlet from the SmartThings app or with your voice via Google Assistant or Amazon Alexa. You are able to turn on or off whatever is connected to it. 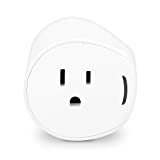 You can also automate your smart outlet so that it will turn on or off when another sensor is activated such as a door sensor or a motion sensor. Smart outlets come in both plug-in forms like the SmartThings Smart Outlet and in-wall forms like the GE In-Wall Smart Outlet so that, whether you own your home or not, you can have the solution that fits you best. There is nothing worse than going on vacation for a few weeks and coming home to a burst water pipe, except maybe being asleep when your pipe bursts. 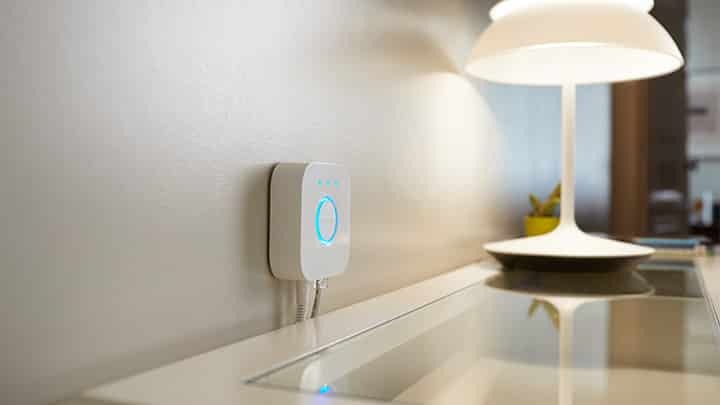 SmartThings has water sensor compatibility, meaning that not only can it alert you if it detects water, but it can also activate other SmartThings compatible devices like a siren or your lights. The water sensor works simply by placing it near where you'd expect water to leak like a pipe or the dishwasher. When water touches the sensor it activates and performs whatever function you've set. SmartThings is compatible with the FortrezZ Moisture Sensor and the Iris Smart Water Sensor. Motion sensors are devices that detect motion and then report back to your hub in order to carry out various tasks. You can do things like turning your restroom lights on when you enter or set off a siren when someone enters your home at night. SmartThings is compatible with motion sensors like the Iris Motion Sensor and the GE Portable Smart Motion Sensor. Fire and smoke detectors are devices that you can place around your house and they will alert you in the event that there is a fire in your household. Fire and smoke detectors that are connected to Smart Things can set off sirens in your home, turn the lights on and more. Instead of having one alarm go off in the kitchen when you are sleeping, you can have your bedroom lights turn on and the siren in the hallway alert you. SmartThings is compatible with a few different smoke detectors like the First Alert Smoke Detector and the First Alert Smoke And Carbon Monoxide Detector. Sirens are useful devices that can be placed around your home and used for a number of things. You can have them go off when a motion sensor is tripped or when a smoke detector detects smoke. Since they are connected to SmartThings, you can assign them to pretty much any task you see fit. The Aeotec Siren and the FortrezZ Siren Strobe are both compatible with SmartThings. SmartThings is compatible with an array of cameras. Cameras that are connected to SmartThings are capable of connecting to devices in your house like lights and performing tasks such as turning the lights on when they detect motion. Cameras can also alert your smartphone if motion is detected so that you always know someone is at the door. SmartThings is compatible with Arlo and Ring. It's true that Google Assistant and Amazon Echo are compatible with a few door locks. Samsung SmartThings extends this compatibility with additional door locks as well as the ability to tie into the SmartThings ecosystem. With SmartThings you are able to turn smart switches on and off when you lock or unlock your door. You are also able to use sensors like the SmartThings Arrival Sensor to automatically unlock your door when you get home. SmartThings is compatible with locks from Yale, Schlage, and Kwikset. SmartThings has a nifty sensor called the SmartThings Arrival Sensor that you can attach to your keys or leave in your car. It activates when it is in range of your SmartThings system and it serves a whole bunch of functions. An example would be the ability to turn your lights on when you come home, or for your door to unlock, or even both. The arrival sensor is possibly one of the most convenient sensors on the SmartThings ecosystem for its ability to interface with most of your other sensors in a way that allows you to customize your home to come alive when you get home so that everything is waiting for you, just how you want it. Smart thermostats are devices that can control the heat and air conditioning in your home. If you are just using a personal assistant, your functionality is limited. If you are using a SmartThings Hub, however, you are granted extended functionality. Not only are you able to control your temperature with your voice, but you are also able to control the thermostat, along with all of your other devices, from the SmartThings app. You can trigger your thermostat to warm up the house when you open your door or come home, you can set routines and more. Samsung SmartThings is compatible with Ecobee and Honeywell smart thermostats. SmartThings is compatible with a range of smart speakers. Not only are you able to incorporate them into routines and play music, but you can also use them as a doorbell, alert system and more. Smart speakers are unique in that they serve a variety of functions while also being able to play your favorite music in any room of the house. SmartThings is compatible with the bose array of smart speakers so that you can find the best speaker for any room of your house. On unique gadget that SmartThings is compatible with is the smart shade. Smart shades can automagically let light into a room at a certain time of day, close at night, be incorporated into routines and more. Thanks to SmartThings you are able to add smart shades to any room in the house. SmartThings is compatible with Bali Autoview Shades. 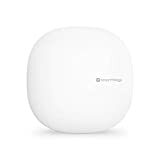 The SmartThings Hub is really convenient but it's also another hub that you have to connect to the wall and it takes up even more space in your home. If you are really big into smart home tech, you no doubt have little modules taking up all of the outlets in your home. The Samsung Connect Home and Connect Home Pro are mesh WiFi routers that can take the place of the router that you currently have in your home as well as function as a SmartThings Home Hub. This device kills two birds with one stone and it also is a mesh system, meaning that you place multiple little Connect Homes around your house so that you get great WiFi reception everywhere, even if you have a large home. We've covered IFTTT briefly in other posts. 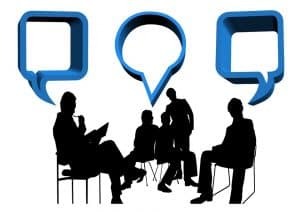 If This Then That is a service that allows you to connect one device or service to another in order to accomplish functions that aren't normally supported. IFTTT is compatible with SmartThings allowing for nearly infinite possibilities. 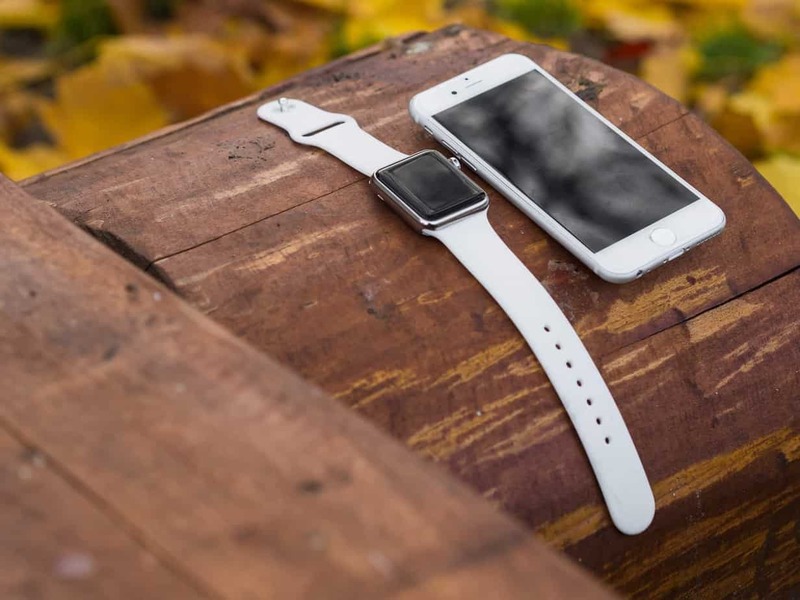 Some of the pre-created applets allow you to receive a call when your SmartThings system detects water, receive a notification through IFTTT if a door is opened when your system is armed. You can even set Arlo to start recording when it detects motion or a window or door is opened. You can also create your own applets fairly easily so feel free to play around with it. Routines allow you to carry out several consecutive programs with just one input from you. Good night, for example, can close your shades, turn the lights off and lock your doors all without you having to control each module individually. There are tons and tons of combinations for routines that you can set for all occasions like dinner or movie night so that you can adapt your home to any situation. When it comes to extending your smart home's functionality, it pays to have some kind of home hub. One of the best hubs out there, the SmartThings Home Hub, is compatible with hundreds of sensors and devices, has excellent support and is pretty easy to use, as well as goes beyond the capabilities of a Google Home or Amazon Echo, making it an ideal choice for beginners and veterans alike.